My visit to The Peached Tortilla was part of the Central TX BBQ Run. 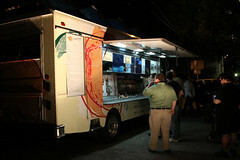 After getting our fill on South Lamar, we moved downtown to West Sixth Street to search out some more food carts. Our primary stop was The Peached Tortilla (which labels itself “Austin’s Fusion Taco Truck”), which sports a very expansive menu of tacos, primarily using Asian-inspired dishes and ingredients. Highlights include pad thai, banh mi, chicken satay, catfish, szechuan veggies, and more, as well as a healthy assortment of sliders (including crab cakes!). After looking over the menu, I settled on the chicken satay tacos, served up on corn tortillas. This was a seriously good taco. The chicken was nicely spiced, tender, and had a good sear on it. The veggies were marinated but still crisp, and the peanut sauce was spicy and flavorful. 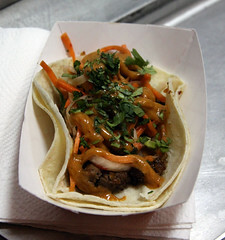 The others in my group loved their tacos as well, particularly the pad thai taco. Overall, Peached Tortilla was a very good example of taco fusion food done very well. I’d like to try out Peached Tortilla again. I rather enjoyed my taco, and would probably have tried out a fair bit more of the menu if I had had the stomach space.